LiveAquaria is committed to offering sustainably raised aquatic life that is either aquacultured or responsibly harvested, which includes careful attention to both the animals and the habitat. Arrive Alive, Stay Alive®, Risk-Free Guarantee! We back up our commitment to excellent customer service & healthy aquatic life by providing you with a 14-day guarantee, and an unprecedented 30-day guarantee for our Certified Captive Grown Corals! Simply put, our SigNature® Shipping is the best in the industry. Because our first concern is for the health of the aquatic life we offer, we have developed the safest, most stress-free shipping system in the industry. Only the most experienced and responsible suppliers in the industry get to work with us - those who share our commitment to the preservation of our oceans and the life within them. To protect our natural resources, we support companies investing in aquacultured and tankraised species. 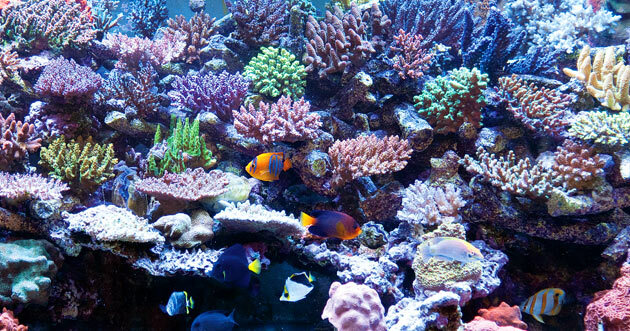 Our Aquatic Specialists help educate aquarium owners - whether novice, hobbyist or a seasoned enthusiast - on the proper care of the aquarium's inhabitants as well as how to provide the best possible aquarium habitat. Our facility uses state-of-the-art equipment and technology to maintain precise water conditions and maintain all aquatic life in optimum health. Learn more about our Coral Farm & Aquatic Life Facility in Rhinelander, WI. The quality and health of our aquatic life is second to none. Each specimen is visually inspected by an experienced aquatic expert before it is selected for your aquarium. While in our care, every fish is offered the proper foods to meet its specific nutritional requirements. Our detailed Acclimation Guide, included with every order, will take you step-by-step through the process of adjusting your new aquatic life to their new home. In addition to the live species you'll find at LiveAquaria, we also offer a quality selection of fish foods and aquarium supplies catering the discerning aquarium hobbist.